Hanoi is the vibrant capital of Vietnam and it is also one of the bright lights of cities in Asia. Vietnam, like many Asian cities, is transforming rapidly, but if you are looking for its historic heart then you will certainly find it in Hanoi. In addition to the gorgeous architecture, much of which dates from the colonial period, you will also find an engaging clutch of museums that will fill you in on all the history of this part of the country. You can also visit traditional Vietnamese monuments such as temples and pagodas, and if you like photography then you will be spoiled for choice here. 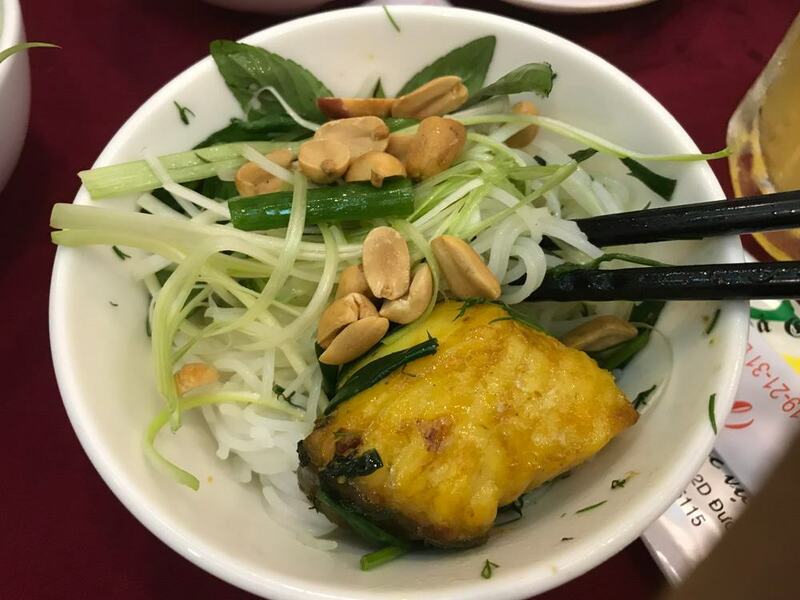 Hanoi is also known for its delicious food scene and you can linger over a bowl of toothsome noodles, or chew on a tasty sandwich like Banh Mi. 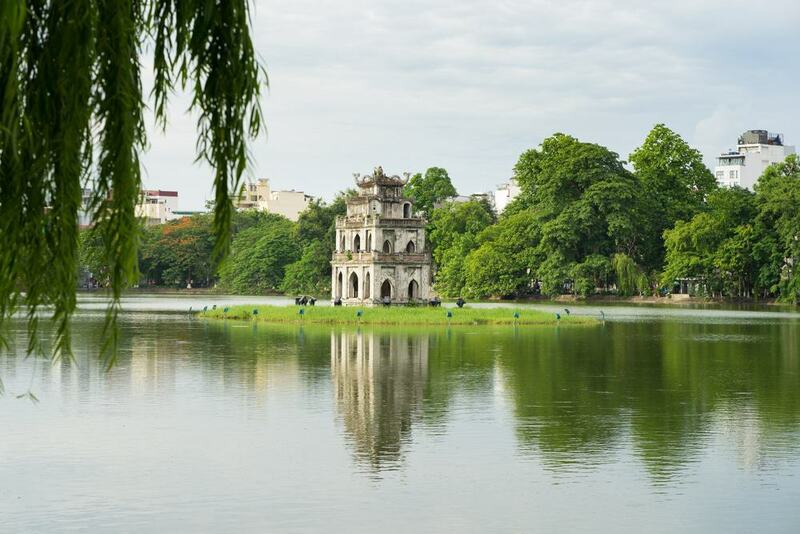 In addition to the food, Hanoi still retains lovely traditional parts of the city like the Old Quarter, or you can stroll around pretty lakes and past lush parks. 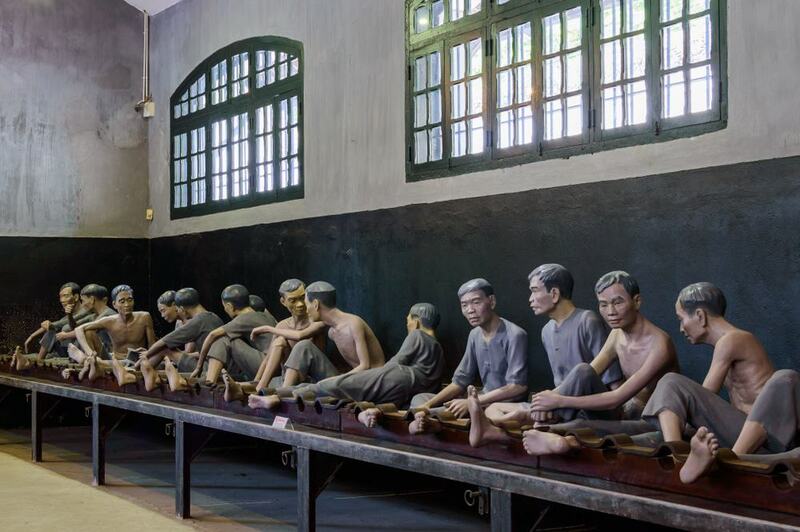 A visit to Hoa Lo Prison is a moving experience and this old internment facility used to be dubbed the Hanoi Hilton. The prison was used to house prisoners of war from the United States during the Vietnam War. With this in mind, you will find galleries that tell the history until the 1950s when it was used as part of the Vietnamese struggle for independence. Some of the grisly pieces on show here include a French guillotine which the colonialists used to execute Vietnamese activists and you will also find memorabilia related to American pilots who were incarcerated during the Vietnam War. 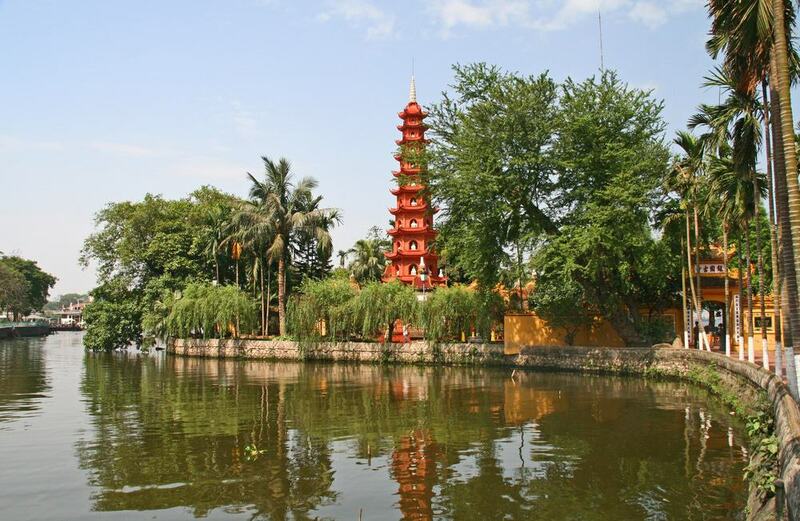 Hoan Kiem Lake is perhaps the most famous spot in Hanoi and is also believed to be a mystical body of water. The reason for this is that the lake is said to have a mythical resident turtle who is the hero of a Vietnamese legend. Locals will tell you that the turtle still swims in the lake, although you will also spot many other real-life turtles here when you go to visit. The main draw now is to take in the pretty vistas across the water and this is the perfect place to go for an afternoon stroll in Hanoi. Perhaps one of the most famous sandwiches in the world is Banh Mi, or Banh My as it is spelled in Hanoi, and is not to be missed when you are in Vietnam. 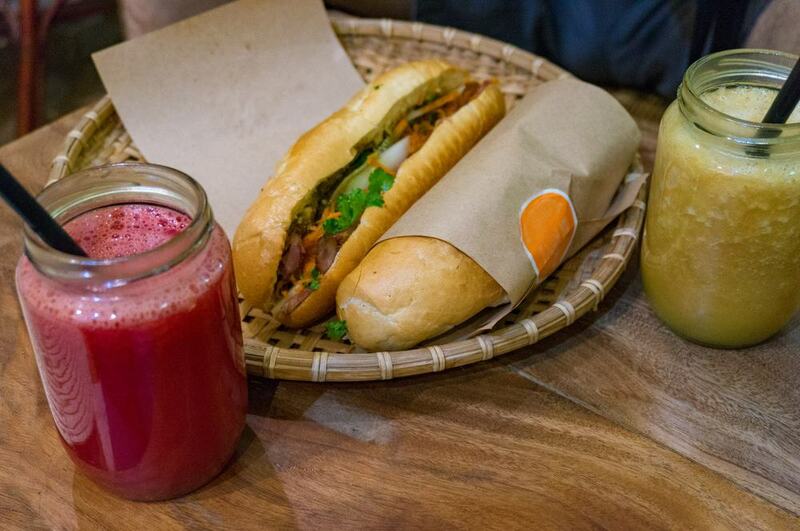 This sandwich is a mix of French elements from Vietnam’s colonial past as well as delicious local ingredients. This means that you can enjoy a soft French baguette which is spread with pate and topped with coriander, carrot and chilies. The fusion of the different elements is simply delicious and Banh Mi 25 is one of the most famous spots in the city to sample a toothsome sandwich. 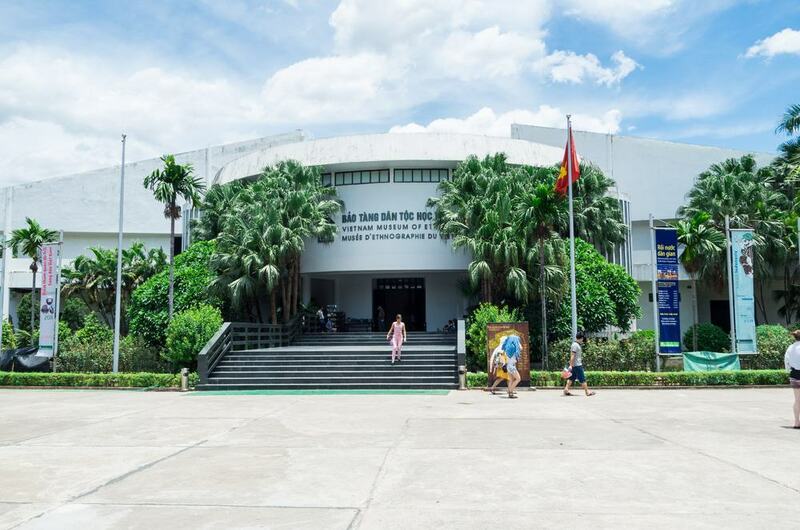 One of the best museums in Vietnam is the Museum of Ethnology which has a huge collection of items that are related to the ethnic minorities in the country. This means that you can enjoy galleries of tribal art as well as artifacts and handicrafts. Other items in the museum include amazing models of traditional village houses and the museum also has some excellent signage in a range of languages to fill you in on all the cultural and historical significance. Nestled in the old Quarter of Hanoi is the pretty Bach Ma Temple which has the claim to fame of being the oldest temple in the city. It has been rebuilt over the years however and most of the renovation work now dates from the 18th century. It would have been originally built in the 11th century during the time of Emperor Ly Thai To in honor of a white horse that is said to have led him to the site of the building. This is also the place where the emperor decided to construct the walls of the city and there is also a statue of Confucius here that was built in 1839. 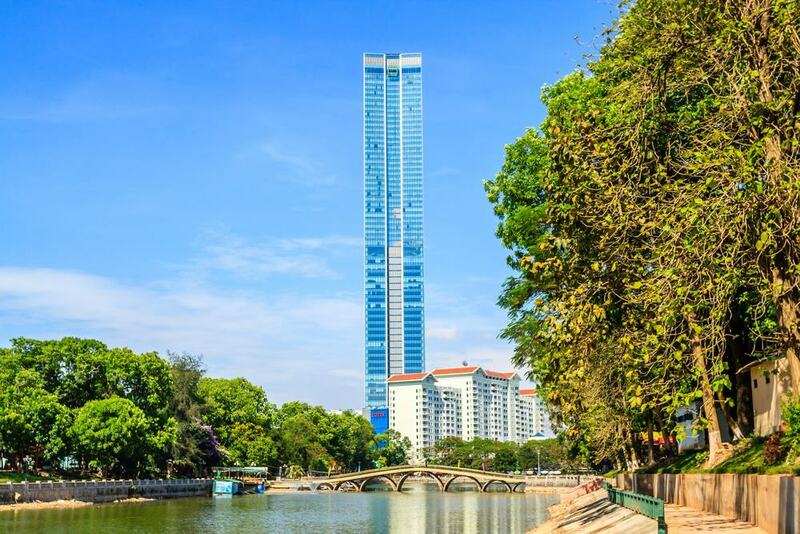 If you want to take in the best views over Hanoi then you need to visit the Lotte Tower Observation Deck. Here you can travel to the 65th floor of the building where you can take in panoramic vistas over the city. These include the Old Quarter which sprawls in every direction in front of your eyes, and once you have taken in the city from a height, you can also visit the rest of the tower. Inside you will find a hotel and well as restaurants and a scenic rooftop bar. 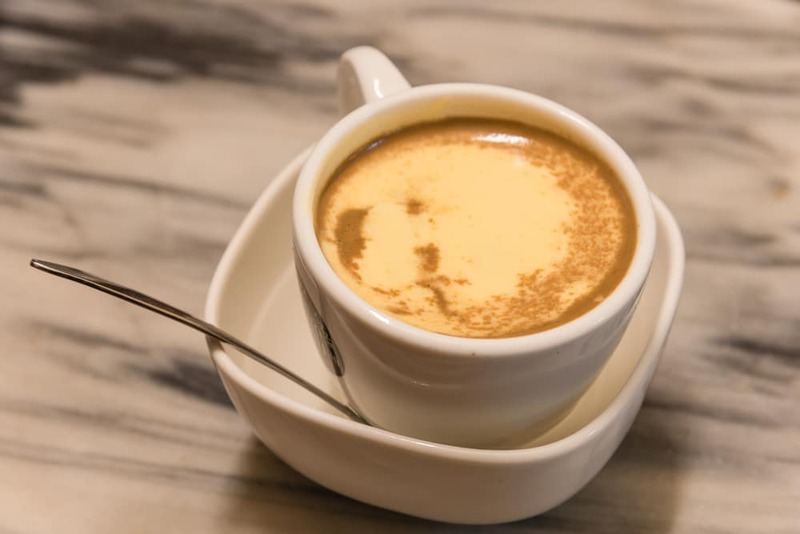 Many people may not realize that Hanoi is famous for its egg coffee which may not sound very tasty but is actually delicious. The coffee is similar in taste to something like eggnog and egg yolks are beaten with condensed milk until they are thick and fluffy. This is then poured over the top of a shot of traditional Vietnamese coffee and leaves you with a smooth but potent burst of caffeine. One of the best places in the city to try it is at Giang Cafe which has been serving up this signature beverage for years. 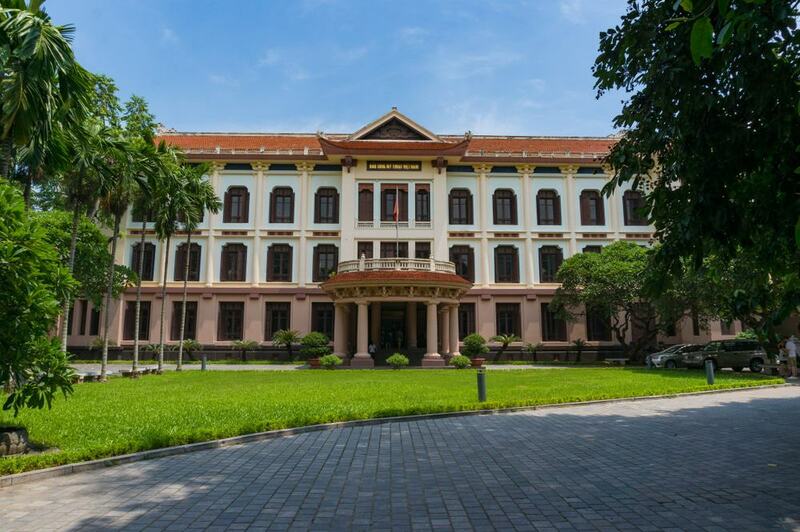 The Museum of Vietnamese History dates from 1925 when it was built and used to be a school during the French colonial period in Vietnam. 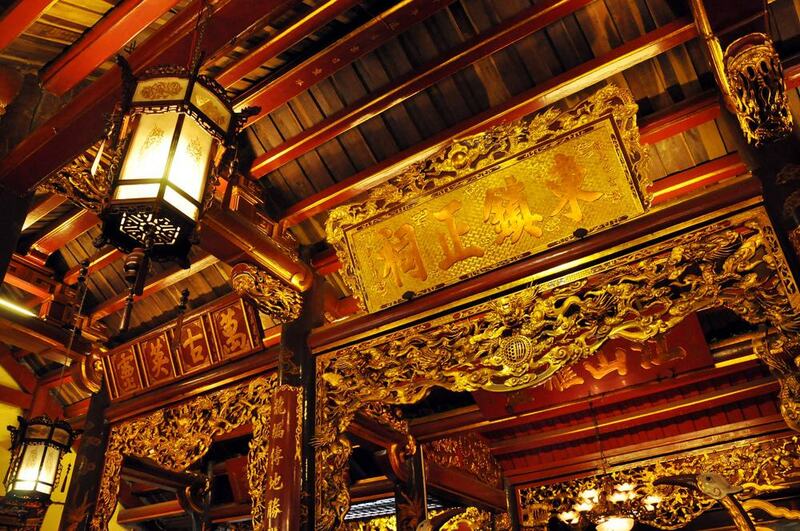 The building is an elegant mix of Chinese and French designs and some things to look out for include bronze pieces that date from the 3rd century BC and are part of the Dong Son culture. You will also find a number of Hindu statues from the Champa and Khmer kingdoms of old as well as galleries of ornate Vietnamese jewelry. 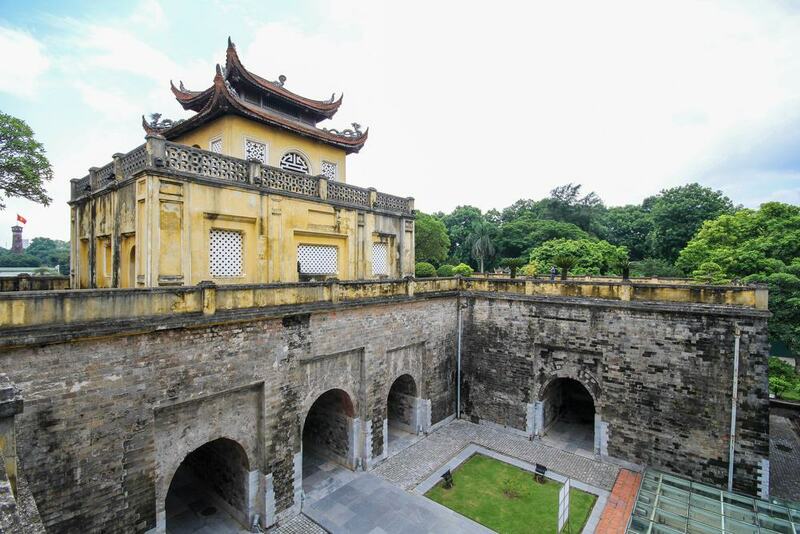 You can also tour galleries dedicated to the French colonial period and the Vietnam War. If you want to try some of the local cuisine in Vietnam then head to Cha Ca Than Long where you get to cook your own delicious bowl of Cha Ca. This is a Vietnamese dish which is made with fish as well as turmeric and dill. At Cha Ca Than you get to cook the fish with fish paste and herbs and this is one of the most authentic eateries in town to try this succulent plate. 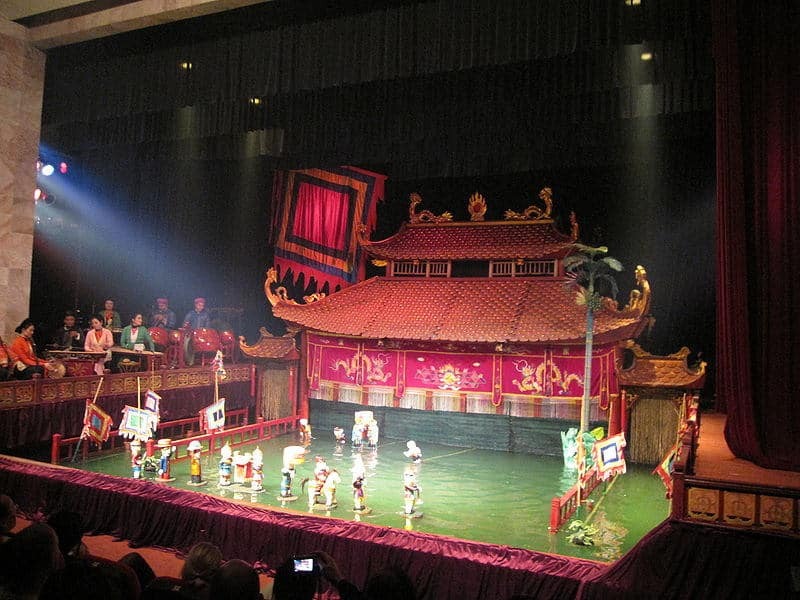 When you are in Hanoi, one of the sights that you absolutely mustn’t miss is a trip to the Thang Long Water Puppet Theatre. Here you will find a theatre that features a waist high pool of water that the puppeteers stand in. They then operate puppets which are fixed to long bamboo canes and it looks as if they are dancing on the surface of the water. The shows here usually tell you the story of local legends and farming stories or Vietnamese myths are also common. This kind of performance is said to have started in rural Vietnam when the rice fields flooded in the rainy season and locals would dance with the puppets on the water to entertain themselves. Visitors often say that one of the best museums in Hanoi is the Vietnamese Women’s Museum which is dedicated to telling the story of the role of women in local society. 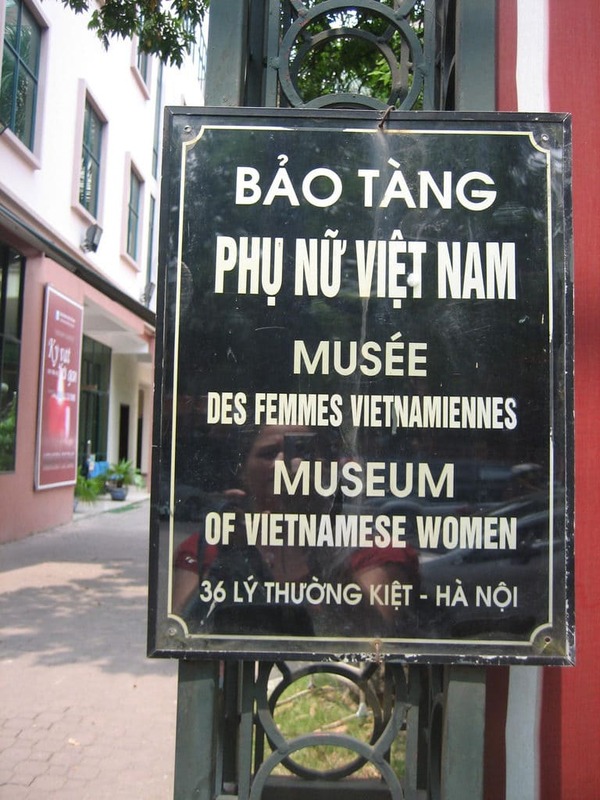 The museum walks you through the history and culture of women in Vietnamese society and you will find galleries related to the role of women in wartime Vietnam. You will also find gems such as colorful local costumes, tribal handicrafts and woven fabrics made by the various minority groups around Vietnam. The Imperial Citadel in Hanoi used to be the seat of military power in Vietnam and would have been an important spot during the Vietnam War. This is also a UNESCO World Heritage Site and you can enjoy some 1,000 years of history here. One of the signature elements of the citadel is the archaeological treasures which were uncovered such as the foundations of ancient palaces. 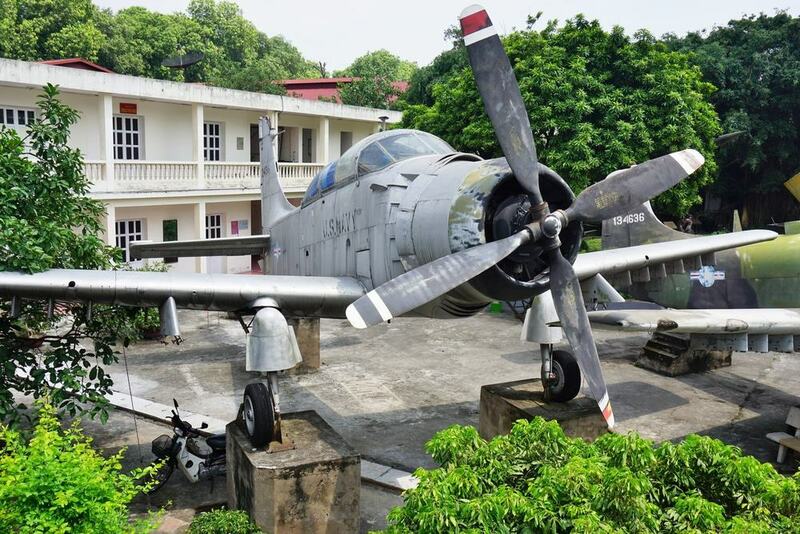 You will also find bunkers here which date from the time of the Vietnam War and you can browse collections of weaponry and even see military maps. 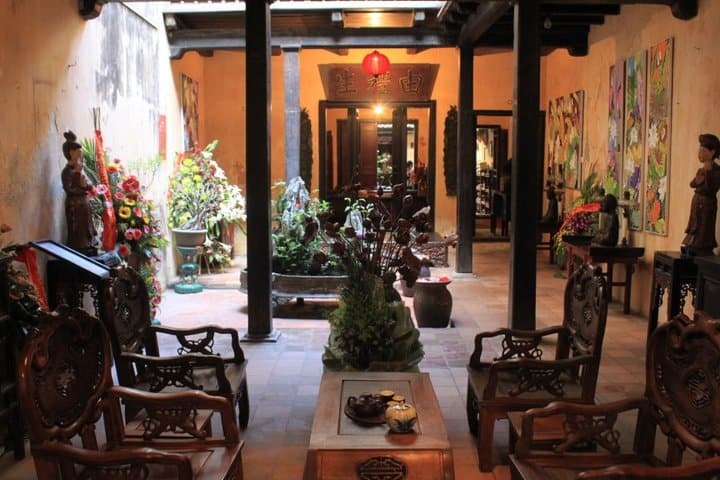 Memorial House is located in the Old Quarter in Hanoi and is one of the best restored buildings in town. The house would have been the former home of a merchant and it has been beautifully preserved and is set around two scenic courtyards. Here you will find some gorgeous antique furniture and there are signature ‘high steps’ between the different rooms which are said to stop the flow of negative energy from room to room. 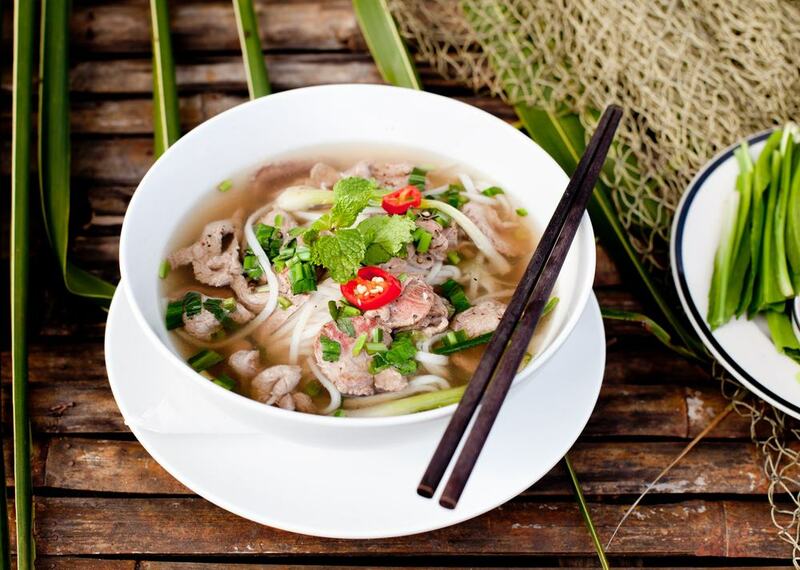 One of Vietnam’s best known dishes is Pho noodles, so you can’t leave Hanoi without sampling a bowl. Pho Bat Dan is one of the most famous spots to sample the noodles in the city and is located in the scenic Old Quarter of Hanoi. You will probably spot the place from a mile away as there is usually a long line snaking out the door, which tells you everything you need to know about these toothsome noodles in broth. Pho Bat Dan simmers their bone broth for hours to make a superior soup and you get to customize this as you wish by adding fresh herbs and chilies to the mix. One of the more modern museums in Hanoi is the Fine Arts Museum of Vietnam. This museum has signage in both English and French and is dedicated to showing you the prettiest art work in the country. Some of the items on show include paintings, sculpture and plenty of ceramics, so if you like arts and crafts then this is one spot not to leave off the itinerary. 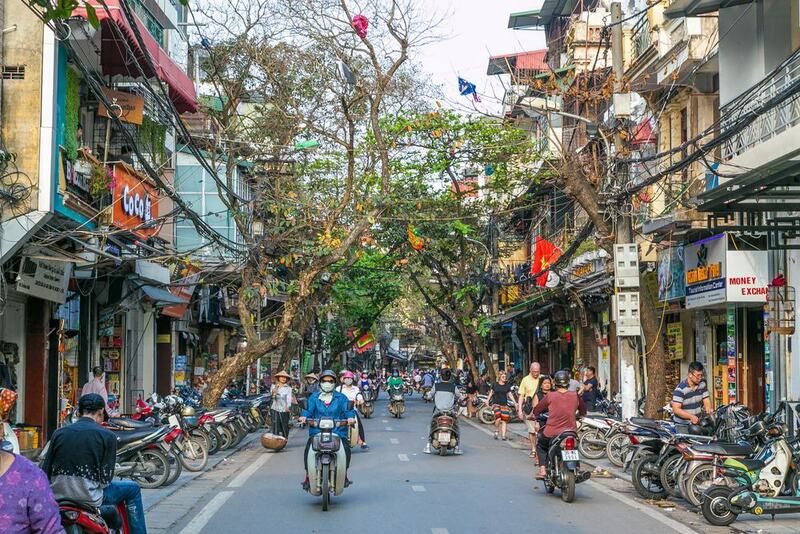 Many visitors say that Hanoi is the prettiest and most traditional city in Vietnam and much of this is down to the presence of the Old Quarter. Here you will find densely packed streets which still retain all the charm of a small local neighborhood. The names of the streets will tell you which shops you will find there, so if you see one called Hang Gai then this means that you will find Silk Shops all along that road. If you are looking to pick up some local souvenirs or gifts then this is the best place to do it and you will also find a wealth of delicious local eateries here. There is also a local night market held in the Old Quarter every night from Friday to Sunday. Ho Chi Minh Mausoleum is a pilgrimage spot for many Vietnamese and you will find a huge complex here which is surrounded by pretty gardens. 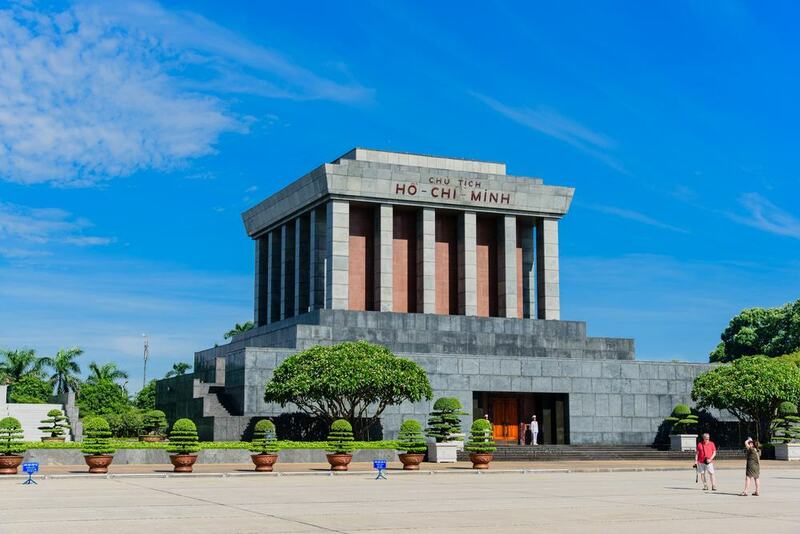 The complex is the home of the tomb of the founder of modern Vietnam, Ho Chi Minh. At the actual mausoleum you will find a marble building which contains the embalmed remains of Ho Chi Minh which lie in a glass case. 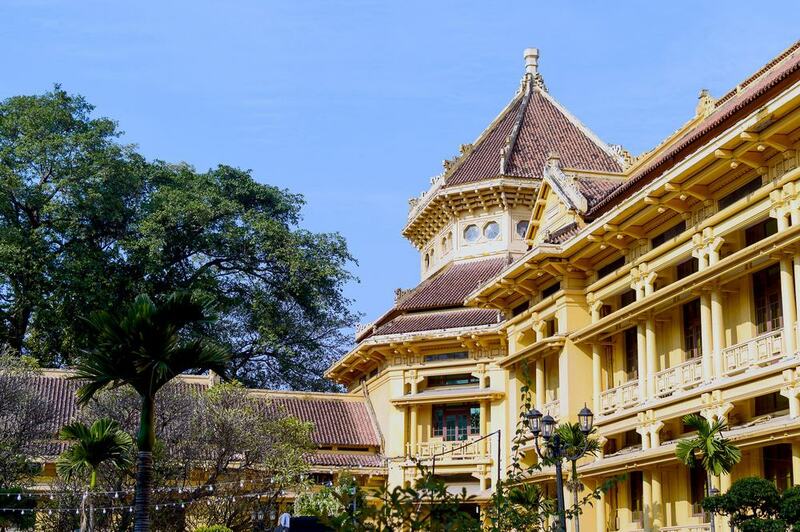 On the same grounds, you will also find the Ho Chi Minh Museum which tells you all about the life of this key figure in Vietnamese history and there are galleries filled with his personal memorabilia. If you are looking for a spot to have a drink in Hanoi then consider the Hanoi Social Club which is one of the most vibrant cafes in the city. The cafe unfolds over three floors and you can get beer or other alcoholic drinks as well as juices and coffee. They have a comprehensive dining menu which comprises both local and international bites and the cafe is covered in hip local art work. 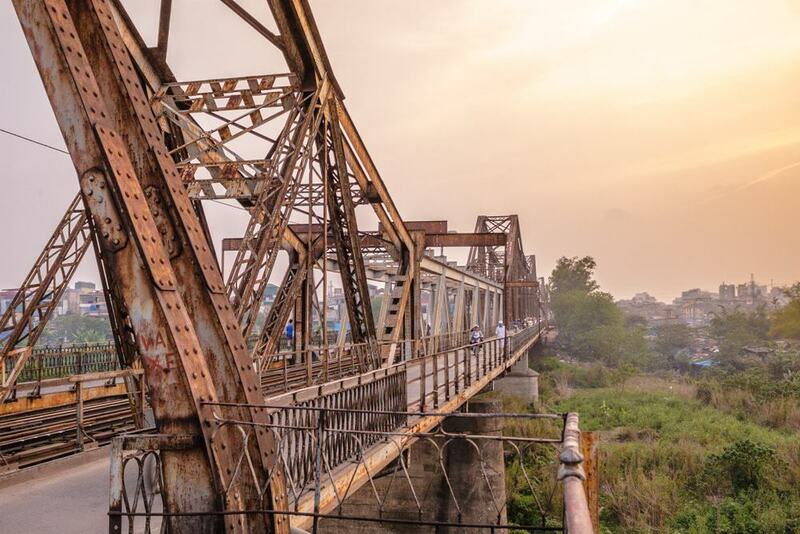 Built from 1899 to 1902, the Long Bien Bridge was designed by architects who came over from Paris. This was the first steel bridge to span the iconic Red Bridge and it is one of the focal points of Hanoi. It would have played an important strategic role during the Vietnam War and is a spot of historical importance in the city. If possible try and visit the bridge in the evening when it is illuminated against the inky Vietnamese sky. There is a pedestrian path that lets you walk over the bridge and street food carts selling tasty snacks abound. If you are interested in Military History then make sure not to miss out on a trip to this famous museum. Here you will find a wide range of iconic weaponry that includes planes that were down during the Vietnam War. You will also be able to find other planes, tanks and even a Soviet MiG fighter plane on show. There are other galleries that take you through the military history with information panels and smaller displays and you can also find a flag tower located outside. West Lake has the claim to fame of being the largest freshwater lake in Hanoi and has 17 kilometers of pretty shore line. 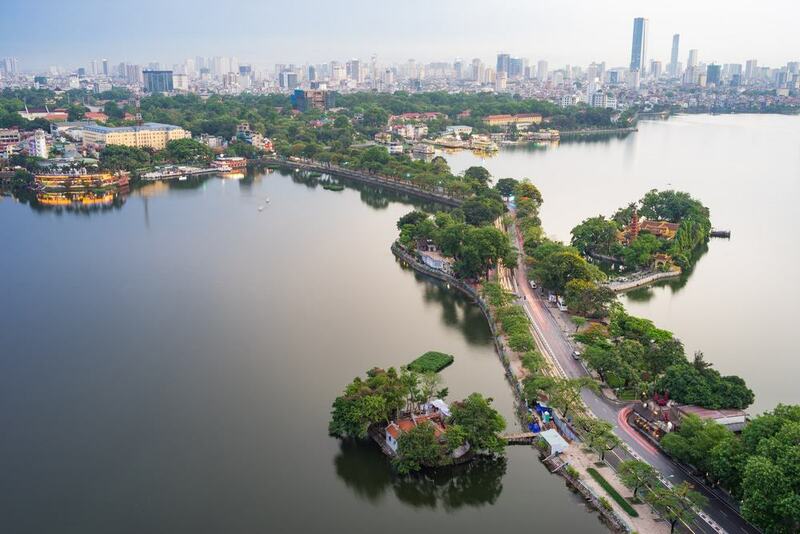 This is one of the most popular recreation spots in Hanoi and you can take in idyllic historic spots here such as Tran Quoc pagoda which is situated on a tiny island in the middle of the lake. Other spots of interest nearby are the Quan Thanh Temple which dates from the 11th century and one of the best things to do here is hire a boat and go boating on the glassy lake. The Tran Quoc Temple has the claim to fame of being the oldest Buddhist temple in Hanoi and was built in the 6th century. There is a historic stele here which tells how the pagoda came to exist and dates from 1639 when the building was erected in the time of Emperor Ly Nam De. The pagoda is located on an island in the middle of West Lake but you can access it via a small causeway. One of the signature spots at the pagoda is a stupa which has 11 floors and is filled with statues covered in sparkling gemstones. 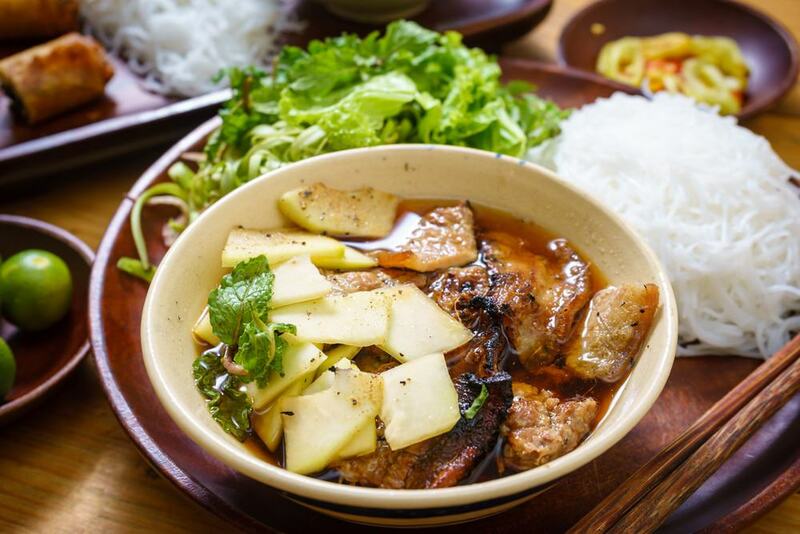 If you come to Hanoi then you need to make sure that you try out the bun cha which is barbecued pork served with rice vermicelli. At Bun Cha Nem Chua Be Dac Kim you can get this traditional dish served with nem cua be which are toothsome spring rolls stuffed with sea crab. Locals claim that this is one of the best places to try this dish in Hanoi. 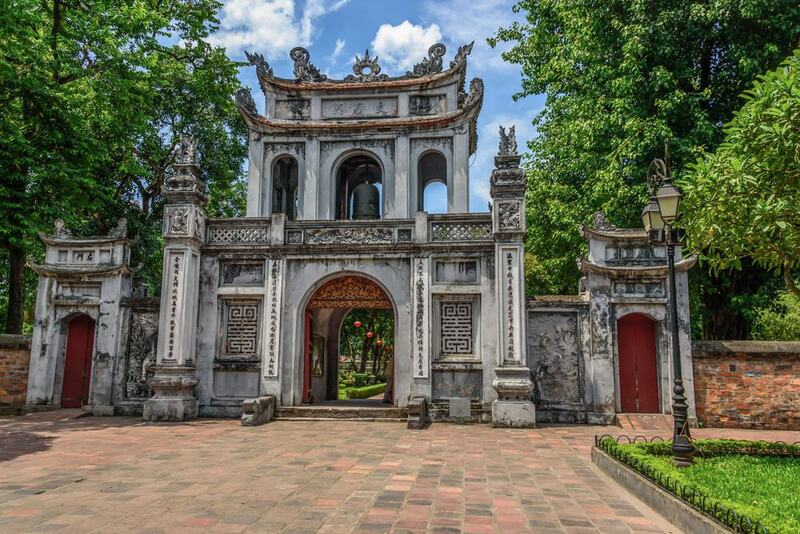 One of the most famous places in Hanoi is the Temple of Literature. 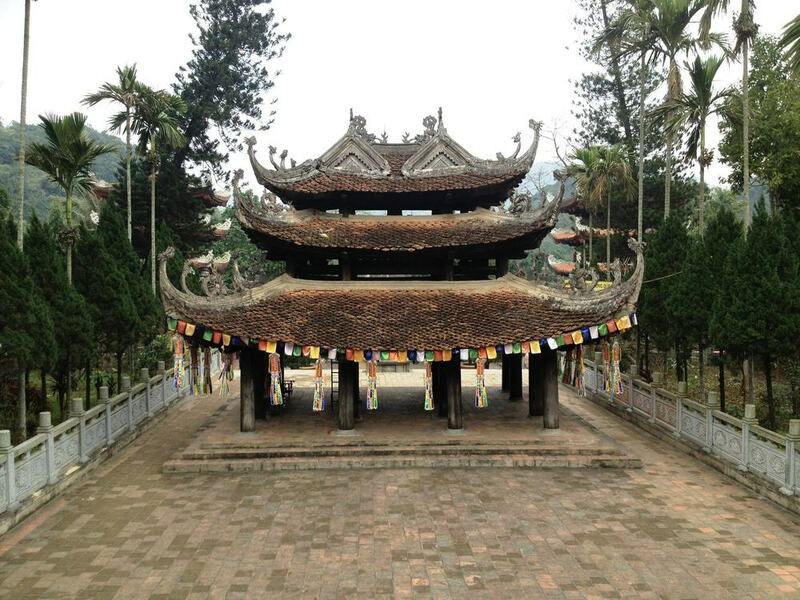 The temple dates from 1070 and is part of a wider complex that includes the charmingly named Lake of Literature. One of the main highlights here is known as the Stele of Doctors and you will find some 82 carved blue stone turtles here which are considered to be holy creatures in Vietnam. If you are a budding writer or publisher, then it is customary to pray at the temple in the hope that you will one day publish a masterpiece. If you fancy a day trip out of Hanoi then consider visiting the Perfume Pagoda. The temple complex dates from the 15th century and consists of a number of Buddhist temples that were built on the side of a mountain. It takes around 2 hours to get to the pagoda from Hanoi by road, and then you will need to take a short scenic boat ride to the complex itself. As you explore, you will climb over rocks and past idyllic mountain streams and this is one of the best trips to take outside of Hanoi if you have time.